Remark: the University of Padova does not have a campus and the Departments are spread all over the town. Therefore, you'd better not simply ask for 'the University' if you don't wish to have fuzzy indications. Try instead to ask for the Department of Information Engineering (Ingegneria dell'Informazione, in Italian) or even better for the 'Portello'. The following instructions are useful to reach Ognissanti street buildings too. The closest airport is Venice Airport, www.veniceairport.it. From there you can reach Padova by cab, shuttle, train or coach. by cab or shuttle: there is an Air service (Coop. Radiotaxi Patavina, www.airservicepadova.it) with a collective minibus at the cost of approximatley 25 € per person. Book 24 hours in advance by e-mail (see site). An equivalent service is offered by Landomas, www.landomas.it. by coach: you can use BUSITALIA bus service (BUSITALIA). Departures are every 30 minutes from just beside airport's entrance hall. In the timetable select VENEZIA AEROPORTO (Airport) as departure (Fermate di Partenza) and PADOVA AUTOSTAZIONE (railway station) as arrival (Fermate di Arrivo), select the travel day (Data di viaggio) and then click on CORSE DI ANDATA. To reach the Department of Information Engineering (DEI), driver stops at 'ex-FIAT' (pron. pheeut) on demand. by bus + train: reach the Mestre-Venice railway station by bus ATVO Fly Bus or ACTV bus n° 15; for ACTV see the timetable from AEROPORTO (Airport) to STAZIONE FS (Railway station), feriale (weekday) or festivo (holiday). Take a train to Padova (Trenitalia, www.trenitalia.com). The trip is around 30 + 20 minutes. Routes and timetables can be found at Trenitalia web site, www.trenitalia.com. 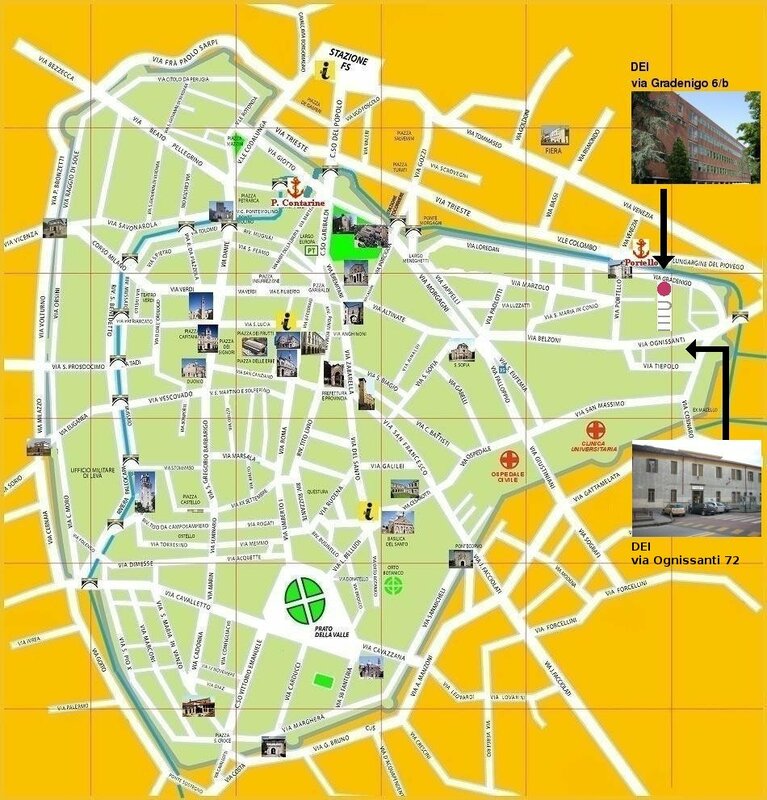 From Padova railway station you can then reach the Department either by taxi, bus, or walk. by taxi: the taxi parking is in front of padova railway station (www.taxipadova.com, tel +39 049 651333). It takes approximately 10 minutes to reach the Department. by bus: From Padua train station take APS bus number 18 and stop at 'ex-FIAT/Portello'. Otherwise, in order to reach Ognissanti Street buildings, take APS number 7 or 9 and stop at 'Ognissanti Church'. on foot: In any case, the Department is at a walking distance: it takes aprox 20 minutes on foot from the railway central station. From A4 highway exit to 'Padova Est' (IKEA exit). The tollbooth leads you in a messy intersection (with IKEA on your right). Move on the right and go up the ramp that take you in the ring road (direction Castelfranco / Town Center). Immediatly leave the ring road at the first exit and follow Town Center. Following the main road, you will reach a two-way street, with five lanes on your way. The central (yellow-painted) lane is reserved to Bus and Taxi. Keep the first lane on the left of the central one. The street leads you to a huge roundabout, named STANGA. You should have the BestWestern Hotel Biri on your right and you might see a big fountain on the roundabout center. Leave the roundabout at the third exit, entering the only rather narrow street surrounded by trees. Make a right turn at the next smaller roundabout and enter Via Gradenigo. After 300 meters, you will find DEI on your left-hand side. To reach Ognissanti Street buildings, turn left at the end of the narrow street surrounded by trees, follow the one-way street and turn right twice. The entrance is at 85, Tiepolo Street, on the left. To reach Piovego Riverbank buildings, arrive to Gradenigo Street building. On foot, cross Piovego River on the stone bridge, Lurgargine Piovego is the first on the right.